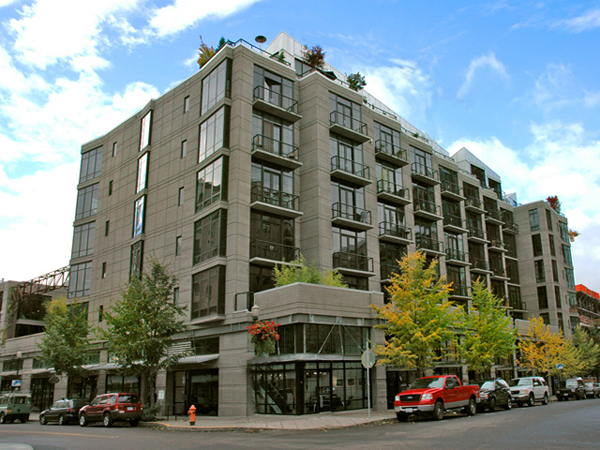 Streetcar Lofts was designed to look like an historic Soho loft building. Built in 2001, it has 139 loft spaces in a variety of floor plans, both single-level and two-level. Streetcar earned national architecture awards for its industrial architecture and interior features. Poured concrete floors and walls, gas fireplaces encased in granite, and brilliantly flexible kitchen and dining areas make Streetcar unique. Amenities include 10-foot ceilings, floor-to-ceiling windows, French doors that open onto European-style balconies, secured parking, a fitness room, and a private central courtyard. There are 5 listings found for Streetcar Lofts. This light-filled loft in the epicenter of the Pearl offers the perfect live/work situation. Generous main living space with separate bedroom. Convertible built-ins with a desk, dining table, and Murphy bed for overnight guests (plus a second bath!). Ensuite laundry, two ginormous walk-in closets for storage, plus a sweet balcony overlooking the backyard habitat garden. Steps to pastry, streetcar and Tanner Springs Park. Tour today! Open concept floor plan with expansive ceilings, bamboo flooring and wall of plants on one of the largest private patios in the Pearl! Perfect spot to start or end the day! Walk out your door to shops, cafes and festivals or stay in and use the fitness center, community room or private courtyard. Extensive Upgrades including vertical plant wall & massive amounts of storage with throughout. Please contact for full list. Welcome Home!